– What is the processor speed of Samsung Galaxy S III (S3)? – Is Google Galaxy Nexus, a CDMA (Verizon / Sprint) or GSM (AT&T / T-Mobile) device? – What is the weight of a Motorola Droid Razr phone? – Does HTC One X feature a front facing camera as well? – Is T-Mobile G2X just the carrier branded version of LG Optimus 2X or do they differ in specifications as well? – How much internal memory does Sony Ericsson Xperia S, have? – When did Verizon release the first Droid phone developed by Motorola? – What are the differences between Samsung Galaxy Tab 10.1 and Galaxy Note 10.1? – Is Apple iPhone 4S just the 4th iPhone or is it 4G ready? – When is Blackberry Torch 2 coming? – How is Nokia Lumia 710 different from Nokia Lumia 800, despite having the same Windows Phone OS? Don’t just do a web search on your phone and wander all over the results, hoping you will find the answer. 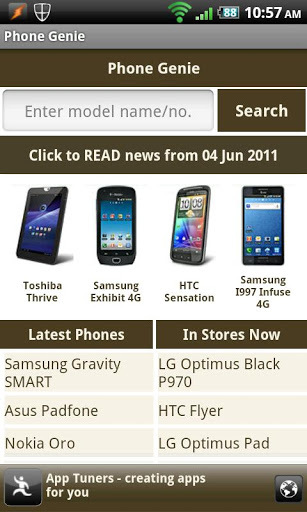 With the help of GSMArena.com, Phone Genie has answers for all the above questions and more. Information on devices from all major manufacturers and carriers (mobile service providers) like Samsung, HTC, LG, Sony Ericsson, Motorola, Dell, Apple, O2, HP, Garmin-Asus, Gigabyte, Acer, Palm, Blackberry, Microsoft, Vodafone, T-Mobile, Sagem, Alcatel, Philips, Sharp, Toshiba, Huawei, Pantech, ZTE, iNQ, Micromax, BLU, Spice, Vertu and more are available at your fingertip. Install Phone Genie today and never have doubts over another mobile device ever again. Phone Genie is in no way affiliated to GSMArena.com. We are fans of GSMArena who believe the site should be conveniently accessible from every single mobile device, regardless of it’s screen size or resolution. This app is only the tip of this iceberg called GSMArena. Always visit www.gsmarena.com directly whenever you are on a PC, because Phone Genie shows only a portion of the website. There are still tons of awesome features available on the website that cannot be integrated to a small screen device. And when you finally decide to buy a phone, always check with the seller that the specifications of the phone match your expectations.